A large glass bottle protected by basketwork or a wooden box, used esp. for holding corrosive liquids. The carboy, also known as a demijohn, is simply a receptacle used in various stages of the wine making process. While a carboy may just be a big jug, it will play an important role in your secondary fermentation and bulk aging processes. Careful consideration of your wine making plans will help you determine your needs. The type of wine you are making, the amount you plan to make, and the duration of bulk aging will all play a role in your purchasing decisions. Carboys come in two basic materials. You can get one made of glass or you can get them made from food grade plastic. Due to the quality of carboys available today, the choice to use glass or plastic is simply a personal preference. If you choose plastic, ensure that you are using food grade plastic. Food grade (PET) plastic will ensure purity in your wine making. Since your secondary fermentation and bulk aging happens in the carboy, you will need to have carboys that match the volume of wine you are making. 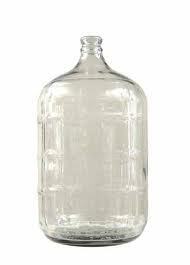 An inexpensive way to stock up on 1 gallon glass carboys is to purchase your fruit juice in the glass 1 gallon jugs. Not only do you have the raw ingredients for a great fruit wine (i.e. Apple Juice) but when you're done, you will have a perfectly suitable 1 gallon carboy. I would recommend that you start with a couple of 1 gallon carboys and a 6 gallon carboy. As time and budget allow, you can always add additional jugs to your mix. In the wine making process, it is always important to keep your carboy "topped off". With that being said, I find it very useful to always have a variety of sizes available to store extra wine used for topping off. As a general rule of thumb, you should have a minimum of one carboy for every batch of wine that you are making concurrently. Optimally (and to save time) you should consider having one extra carboy at your disposal. Your first racking will be from your primary fermenter to your carboy. If you have one carboy per batch, your second and subsequent rackings will be from your carboy to your primary fermenter and then back to your carboy (after cleaning and sterilizing). Having an extra carboy will allow you to rack from carboy to carboy without the extra step. This will save you time, and minimize the oxygen exposure your wine has during the racking process. No matter the size or material you choose, good quality carboys in your arsenal of tools will serve you well for years. If kept clean and stored safely, they will serve you as you craft wine after wine in your home based winery.